TE reels combine the Super Free system with High Efficiency Gearing for the ultimate in casting and retrieving performance. The 300 and 400 Series add a strategically located (yet out of the way) audible clicker to alert you when a fish bites, plus a full-time levelwind that allows the Calcutta's wide spool to function effortlessly. Oversized Dartanium drag, VBS centrifugal brake, Super Stopper, and aluminum frame/spool/side-plates. 5 bearings (4 ball bearings plus 1 roller bearing). "Everything about this reel screams quality. Cast great, perfect drag, large capacity. I use it paired with a Powell rod to throw monster swim baits- great combo." "I used the calcutta for the 1st time this summer and was happy to spend the money on it. I expected to use it only from a boat.I found myself using it for throwing plugs and other lures to stripers." "I bought this reel about a month ago and tried this on lake kinciad for musky and with 65 pound berkly fireline braid which is equivalent to 14 lb. 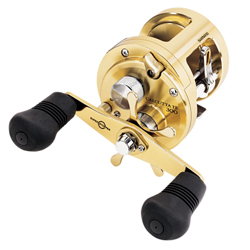 monofilment and with a shimano culacias rod it stould up to a 15 pound musky I highly recomend this reel for and musky or heavy bass fisherman Muskiehunter out"
"I HAVE THE CTE400 MODEL. AND THIS REEL IS SMOOTH. SMOOTH DRAG, SMOOTH CASTING, SMOOTH RETRIEVE !!!!! "